I started Be More with Less 5 years ago and thanks to you, we’ve created a thriving community of people who want to live with less stuff to make room for full, beautiful lives. Writing for you over the past 5 years has been a tremendous blessing. You helped me find my voice, and find my way. Because of that, every day, I …. Do work I love and care about. Work with people who lift me up, and let me lift them right back. Have the time and clarity to take care of myself. Own less and love more. All of those things are because of you. I had an idea, and the willingness to share it, and then you brought it to life. You encouraged me, shared my stories, and celebrated your simplicity wins with me. If you are here for kitchen appliances, luxury vacations, or a brand new car, you might be disappointed, but if you are here for what really matters, for the stuff that makes a full life sweeter than a full house, I’ve got your back. We know these gifts are the most meaningful, but based on the highs and lows of life, they aren’t always within our reach. Please take the ones you need most right now, and give the others away. Someone in your life needs one of these gifts right now. If you are stuck in the past, or worried about the future, use this gift to come back to where you are right now. Hold this one, precious moment. Look around, take it in. Be present for the people in your life, and for what matters most to you. I know you’ve heard it before, but you can’t change anything that has already happened, or be completely certain about what happens next. The remedy for the angst or fear that may cause is the present. In my experience, being grateful makes the good times better, and the hard times easier. There is always something to be grateful for. Find and acknowledge those things everyday and you’ll build resiliency and a deeper appreciation for what you have. If things aren’t happening fast enough, and that’s frustrating for you, consider that things are happening at the rate in which you can handle or fully appreciate them. Use the frustration as a reminder that you aren’t in control, that there are other things in motion, and that things will unfold in their own time. Rushing, pushing, or willing something to be more immediate will cheat you of what will result if you give it the time and space to be what it is. If it’s people you are losing patience with, consider this thought someone shared with me. Perhaps the people who test your patience were put in your life to help you develop patience. If you want to know the qualities you need to work on, look at the people in your life. They are there for a reason. Question things. Experiment. Ask, “what would happen if …?” and then try it. Be curious about your health, your life, your surroundings. Add playfulness to your curiosity and you’ll feel ten years younger, almost immediately. My word of the year is clarity. Clarity doesn’t override uncertainty, but it’s the gift that allows you to see clearly, make decisions with confidence, and to open up to not knowing. When you do that, you make room for the knowing. Compassion doesn’t solve problems, or try to fix things. It only recognizes that at the heart of where ever you are, it’s ok. We can fix things later. This is the gift that rescues me from fear time after time. When you are worried, or scared, turn to hope. If you aren’t feeling well, struggling with a chronic condition, or craving better health overall, make it your priority. When you put your health and vitality first, you can better serve the people around you. Eliminating stress is how I reclaimed my health, and detail that process in this 60 minute video course. Your good health will invite all of these other gifts into your life. More love. Always more love. Letting go isn’t easy until it is. I hope you’ll use this permission slip to let go of whatever isn’t serving you, or adding value to your life. From stuff in your home, to regret, anger, winning an argument, comparison, perfection and self-doubt. None of those things make you stronger, happier, healthier, or more receptive to what matters most. Let it go. 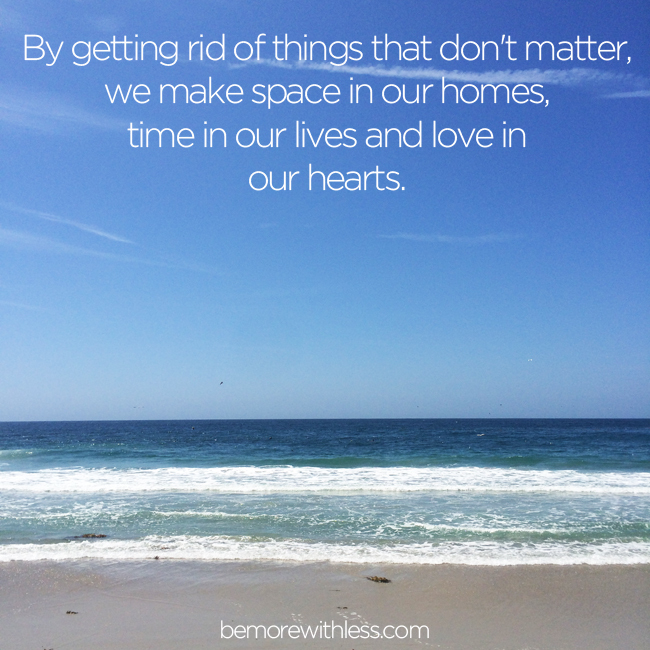 By getting rid of things that don’t matter, we make space in our homes, time in our lives and love in our hearts to embrace and appreciate the real gifts. To continue the celebration, I’m giving away a microcourse of your choice to 5 people who comment below. Comment with the course you’d like to win, along with a gift mentioned above that you need most, or another gift that you think people can use. I moderate comments, so your comment won’t show up right away, but please only comment once and don’t include links in your comment. I’ll pick 5 winners by random drawing on Monday, May 11th. Celebrating 5 years of Be More with Less makes me think about the next 5 years. I have new ideas on what I want to create and how I want to better serve you and spread the message of hope in simplicity, and I’ll be sharing that with you in the coming months. Today though, I think I’ll stay right here. I want to be present for the celebration, for the joy, and for the gratitude I have for your kindness, vulnerability, support, and love. I’m very interested in the course on developing a morning routine. Hi Courtney – I always love your posts and you are an inspiration to me in many ways. What I really need now is clarity as I am building a business and struggling with finding a niche that will work. My business is my ticket to a simpler lifestyle with more freedom! The 2 courses I’d be most interested in are Zero to 100 blogging course or the micro business that matters course. I have already purchased the other two 🙂 Thank you for your lovely gift – regardless of whether or not I’m the recipient. i would love to take “Zero to 100: a micro course for beginning bloggers.” I’m hoping to open my own Etsy shop and feel the need to have a blog to support it. I’ve done some blogging but I’m sure I would learn a great deal from you! Re: the gift I need right now, that would be clarity. My husband and I are faced with some big life decisions this year and a clear view of our priorities is important. Thank you for all the gifts and a chance to win one of your courses. Thank you so much for creating this website and the resources you offer! Thank you for the gift of increased Presence. The best thing I can do to stay out of stress and fear right now is to stay in this moment. I’m hoping for the courage to start my own blog – I’d love a copy of the Zero to 100 course. Thank you and congrats on 5 years! The gift I can use the most today is compassion. I am interested in How to Create a Meaningful Morning Routine. I’d love to win the Start a Microbusiness course. The gift I need most is health- struggling with an autoimmune disease all I want is to be as well as I can. Although more patience and hope to deal with getting well would be great too! I’d love the capsule wardrobe course. I’m a young 50ish SAHM with teenage kids. Most help is for working, younger women. I’ve pared way down but still have a ways to go. Five years have flown by. I have enjoyed every post and found them to be thoughtful and encouraging. Thank you for all you have done! I can’t wait to see what comes next. Congratulations on all your success! The gift I need most is stillness. Thank you for reminding me. I would love to win the Dress with Less course. I have been reading Project 333 for a while and have gotten rid of a lot so far … but haven’t taken the plunge. The gift of patience appealed to me most today. In a time of turmoil, planning a move to a new state, I’m overwhelmed with tasks and sometimes wish I could rush through the next six weeks. But maybe you are right that I need to appreciate the speed things are going because I need the full six weeks to tie things up properly and move on, and I really can’t do any more each day than I’m doing already! Thanks for reminding me! I’d most like to win the capsule wardrobe course. Thanks ! And keep writing!! Dress with Less. I started reading your blog about a month ago. Since then, I have donated at least 20 bags/boxes of clothes, shoes, dishes, decorative items and feel so much lighter! I simply love how my house looks now and feel more serene when I come home to a clean and uncluttered home. I find that I have more time to devote to the things that matter in my life; my relationships with my family members and my friends. I don’t feel as hurried and I have found myself to be more productive and as a result, happier! Thank you! Congratulations Courtney! You’re such a great source of inspiration. Thanks for all you give. For me the gift of compassion is something I’m personally focusing on. This would not be possible without the simplicity I’ve worked towards in my life. Keep the prompts coming! I’d love to receive the Zero to 100 blogging course. Perhaps it would give me the tools to take the plunge. I would love the morning routine microcourse, I have been considering for a while just wasn’t sure if I was ready to commit. 😉 I am an avid follower of your blog since 2011 and you have opened my eyes to so many things, and had such a positive impact on my life. I need to focus on presence and stillness. I struggle greatly with both of them. I’m most interested in the morning course. And I could definitely use the gift of stillness in my life. Perhaps I could work that into my morning routine! I would love to take the Zero to 100 blogging course! Thank you for the give-away! I’m very interested in the “Starting a Microbusiness” course. I’ve been interested in expanding my income streams, plus I’ve purchased a couple of books of yours in the past … and like your writing. Hi Courtney, can’t believe it’s been five years. Thank you for the gift of your writing it has helped me so much. I have already done the courses I needed, but wanted to comment to say thank you for the gift of stillness. I needed to read this today. Blessings, Jean. Congratulations on 5 years! I am not sure if I have ever commented before but you have inspired me the past few years to get out of debt (almost there!) and to declutter my life in so many ways! Both were very much needed it my life. So thank you for that. I would love to opportunity to try the meaningful morning routine course! The gift I need right now is Patience. I recently suffered a very extensive ankle injury (3 broken bones and a torn ligament) and have quite a long road to full recovery. While I know the situation is temporary, thus far it has tried my patience more than I imagined it would! I would enjoy the Zero to 100 course. Thanks for continuing to give encouraging and supportive commentary! Presence is the gift I have been working on this year. 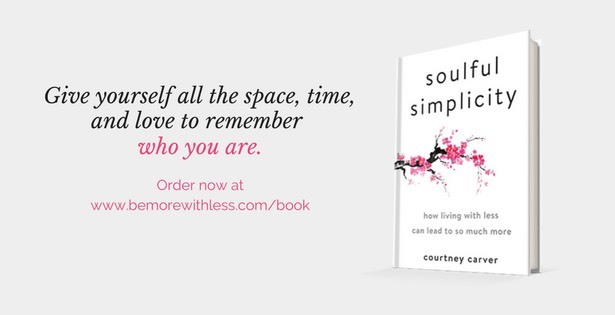 Thank you Courtney for the inspiration – I often read old posts to help guide in my journey. I’d love to do the Dress with Less course, I have been drawn to the idea of a curated wardrobe for a while now. This may get me into doing rather than thinking! Thank you for sharing your story and wisdom! I’d be interested in the course ‘Dress with Less and Create a Capsule Wardrobe’. The gift I need most is health. I have been really successful in managing a chronic illness in the last five years or so, but since my son was born, I haven’t been taking good care of myself. Like many people, I have struggled with feeling worthless because of my appearance; sometimes that infects my attitude toward exercise. I know that it’s only when I am kind to myself that I really make progress in improving my health. Still, I find it so hard to stay in that place of self-care, mentally, when it comes to my body. I would be interested in the ‘Dress with Less and Create a Capsule Wardrobe’ course. I’m on the verge of downsizing and this would give me the help that I’m sure I’ll need! Happy anniversary! I love and am inspired daily by your work. I’d love to learn more about how to bring that into my own microbusiness with How To Create a Microbusiness That Matters. Thank you for the gifts. They are all needed at the moment, but health rings top of mind. Through my work, I hope I’m helping to impart health on others. But I want to be a better example. Congratulations on your 5 year anniversary! That is quite an achievement!! I’m so happy to follow along with you and your journey as you encourage me and many others to be more with less. The gift I need most is presence – I’ve been multi-tasking way too much lately and I’m not taking the time to stop and appreciate the moment. The course I would love to win is “How to create a microbusiness that matters.” Thanks! Wow! 5 years! You are an inspiration to me to keep my blog going. Sometimes it gets tough to keep going after only a few months and no apparent signs of “success”. Thanks for all the great posts Courtney! I definitely need a lot more hope and clarity in my life. I have been eying the Microbusiness course since I am drafting some new guides that I want to start selling. It’s a tough choice between that one and the morning routine one (my morning routine is abysmal on some mornings). I really need the gift of compassion for myself. I give compassion and advice to others, but I never gift it to myself. I feel I’m not worthy to receive such a beautiful gift. But, actually…I’d like to learn more about capsule wardrobe because I feel if I had less “junk” in my life, I would be able to be self-aware and accept compassion from others and myself. The gift I most need is presence. I find myself constantly distracted by life, worries, electronics, to-do lists etc… All kinds of things that I can’t change but I worry about them anyway. I’ve been practicing just doing one thing at a time. When I’m watching tv, for example, and one of my kids has something to say, I pause the show, turn to them and really listen. It is a small way to make a big difference. Both to my child and for myself. The course I would like to win is the Microcourse on starting a blog. Congratulations, Courtney! I’ve been following your blog from when you started it! I absolutely love this post. Right now the gift I need the most from your list is “letting it go” I am in the process of clearing out stuff from my house and I am guilty about being past the deadline of April 15 I set myself. I am trying my best to “breathe” and keep at it steadily, but am also grateful that I have been enjoying a lot of family time. The gift I’d love to give my son from your list is “hope”. Because he needs a lot of it to get him through the next three months as his future unfolds. I am going to treasure the list of gifts you’ve already mentioned! I would love to take the zero to 100 microcourse. I’ve been flirting with leading a minimalist lifestyle. I may have to move in the near future, so the course is perfect timing for the changes that may happen in my life. This gift I definitely need is stillness. I never seem to find anytime for that with work, homeschooling, general day to day life. Ah – to be still! I would really like to receive the Dress for Less Capsule Wardrobe course. That has really be in my periphery lately and I would be keen to see how that could work for me. How to create a microbusiness that matters – please. I’ve been following your blog for a while now and find it inspiring, I’m on a journey reducing my stuff and identifying what really matters and you’ve helped me no end. I’m in a confusing place right now and feel that work is one of the next areas needing my focus and attention, but I’m stuck – any help would be amazing! I find Gratitude and Compassion (and maybe a little Presence) get me through most tough moments. We’ve had some tough ones lately in our house and I’m trying to insert these gifts everywhere I can. I’m constantly flirting with Project 333, so I’d love the Dress with Less and Create Your Capsule Wardrobe. Happy Anniversary! I refer to you as my “virtual mentor” and I have done all of your courses except for how to start a Micro-Business and I am planning on doing that one whether I win it or not! You have inspired me to inspire! As soon as I tried minimalism and a simple life, everything started falling into place. The clarity that I had just by believing in less instead of more has changed my life forever. I now dedicate my life to helping people live more meaningful lives through having and doing less! Thank you for all that you do. I have really enjoyed reading your blog and the wonderful insights you share. I need the gift of patience as I am frustrated by a desire to leave my job and start my own business. I am struggling with knowing what direction to take and the fears of the unknown! I have patience with others, but not with myself! I would love to take your class How to Create a Microbusiness that Matters. I had found your Dress with less and capsule wardrobe idea on another site, which led me to you. Thanks for sharing your gifts! Congrats on your anniversary! I would love the course on Clarity. I’m in my 50’s now and trying to make decisions for retirement, etc. Congratulations on 5 years and all that you have done to create a life that matters and your willingness to share your journey and lessons learned along the way. I would love to learn about Creating a Microbusiness that Matters. That in turn would hopefully allow me to be more present with my teenage daughter – who besides going through the typical teenage stuff, is addressing other issues having to do with being adopted. Patience would be the other gift I will practice for myself – allowing my daughter the time she needs to go through her own journey – whatever that may be. Thanks and Happy Anniversary! The gift I need it clarity- to open up to not knowing and courage to move forward into a new phase of my life. I would love to win the “How to Create a Microbusiness that Matters” microcourse. The blogging course looks great. I have loved your other courses I have done with you. •How to Create a Microbusiness that Matters – this would be the subject of my choice. Thanks for a chance to win! My business will be about fashion, so I’d love to learn from your Dress for Less, Capsule Wardrobe class. Thanks for being inspirational! I would love to win Dress with Less and Create a Capsule Wardrobe! I know cleaning out my closet and minimizing the items I own would add extra time to my day and ease much of my anxiety. I just need this extra push to get there. I think the gift I need most is Curiosity. I need help finding time to be curious. And I need curiosity to enjoy life to experience playfulness and to experience life to the fullest. I would like the blogging course for beginners. I need the gift of patience. Thank you! Happy Anniversary! I need a few of these gifts, but the one most needed at this time would have to be health. Being recently diagnosed with Atrial Fibrilation has thrown me for a loop and procedures & medications have slowed my lifestyle down… body only, but not my mind! I don’t know how to take care of me first & I know I can’t truly move forward until I do that. I find your posts most inspirational! I’d like to win the Zero to 100 course, as I’ve been wanting to start a blog and write a book for several years now. The course I hope to win is “Create a Meaningful Morning Routine”. This is perfect timing because just an hour ago I was deciding I needed to work harder on exactly this. I always have good intentions but suddenly the whole day seems to slip away from me. I’d like to be able to start directly with my routine and not get distracted. Secondly, the giveaway I most greatly need at this time is Stillness. I seem to either be looking at or listening to something all the time. I envision adding stillness to my morning routine. Thank you. I am very grateful for this post. The gift I need the most is health, as I have chronic illness’s. The course that I would like is “How to create a Microbuisness that matters. Thanks Courtney for all that you do! I need to work on patience. I’m very interested in the Dress with Less class. My life would be so much simpler if I really could dress with less! Wow Courtney, 5 years! That’s great. I look in on your blog every week, and 333 too. It’s amazing how much things can change in 5 years when you set your hearts and minds to it. I really need to work on my curiosity and clarity, because My next 5 years needs to be amazing too (amazing to me, that is, I need to Let Go of giving a rats a**e what other people think). Congratulations on your anniversary!! Your blog is always such an inspiration to me and always encourages me to keep minimizing a little bit at a time. The gift I need most right now is stillness. Something I definitely need to incorporate into my life. As for the microcourses, Zero to 100 sounds excellent and exactly what I need to get my blog in gear. Congratulations on 5 years, Courtney! Your blog and emails have helped me to simplify my life so much! Thank you for everything! and I need the gift of presence. Thanks so much for your inspiration! I would like to win the wardrobe micro course. Curiosity is the gift that resonated with me. I’ve been so darn responsible lately that I haven’t been curious at all. Adding playfulness makes it irresistible! Letting go is always a continual struggle for me. However, letting go of my stuff has helped me let go of other, emotional things as well. I still have a long way to go, both with the stuff and the things, but I will get there one day. I would love the course •Dress with Less and Create a Capsule Wardrobe. I really enjoy your blog! Thank you for your blog. It is always meaningful to me. I would love to learn more about how to develop my own blog. Thanks for sharing all your wisdom to the world. I’m in the process of downziesing my wordrobe, so the “dress with less and create a capsule wardrobe” would be a big Help for me. The gift I’m giving to me and others is Stillness. To listen to the inner voice and let the heart lead the Way. I have always wanted to start a blog as I would like to share with others ideas about writing, family, stress-free living, being an authentic Christian, and being content with less. The course of from 0 to 100 on how to start a blog would be a great help. Your articles have influenced me to help clear out my mom’s home of 60+ years and made it easy to discard all items that were damaged, outdated and keep the best items to divide with my sisters. This project was done in eleven days and I used a systematic approach from one of your articles to accomplish this task. Thank you for all the gifts you listed. The gift for me right now is patience. Being willing to let things unfold in their perfect time, for the highest good. I am very interested in your course about developing a morning routine. Thank you for all of your inspiring ideas and advice. I really enjoy reading your blog. The course I would most like to win is Zero to 100: A microcourse for beginning bloggers. The gifts I need most right now are health and hope. I was recently diagnosed with thyroid cancer. I had my thyroid removed, and will start post op treatment soon. I need hope to know that I will survive this and get better, and I need health so I understand how best to help my body heal. I would love to have access to How to Create a Microbusiness that Matters! I am in the process of creating my “empire” so that my husband and I can move to an island in 5-7 years! I am a group fitness instructor and intend to continue teaching and growing in my fitness prowess. I just started as a distributor for Juice Plus+, which will also help me to motivate others toward health, wellness, longevity and vitality!! I want to be available in person and virtually to share my passions (& to make money)! I have been living mindfully for many years, as well as minimally ~~ which will be necessary when we move from the States to an island, right? 🙂 Thank you for offering an anniversary present to your readers! Congratulations on 5 years of success and I wish you many many more! I so need the morning routine course. Life has been crazy lately! Gratitude is the gift I’m giving today. The gift I need most now is presence. I struggle with knowing what the future I want looks like but am unable to act on it due to family obligations. Then I feel guilty for not appreciating the present and the few years I have left with my high school aged son and aging parent. I am most interested in the course on how to develop a morning routine. I am not a morning person but long to be calmer and more emotionally available to those that need me later during the day. Thank you for all the goodness you’ve shared over the past few years. The gift I need is patience! I would love the morning routine course. I am truly in need of presence just now. I am stuck in the past at the time of my wifes’ passing and I truly need to take a moment to just be in the ‘now’. As for a course, anything from you will be worthwhile, and if not chosen, then I’ll just remember to be in the present. Thank you for your words, compassion and thoughts. Hi Courtney! Thank you for the gift you give us each time you share your wisdom. I choose the gift of compassion, with myself, my family and the world. I would love a mini course on dressing with less. I have been lurking around P333 for far too long. It’s time to dive in. I just finished cleaning and leaning my closet, but have already given in to bringing hime a couple of new pieces. Help! I am interested in How to Create a Microbusiness that Matters. Letting go was the one that popped out the most. I am a full time social work student and mum. Life is very stressful and challenging.Yet getting the degree was to fulfill the goal of making life easier with a better paying work. I am wondering if I need to rethink this goal and if there is a simpler way to go about it. Letting go just by being open to different ideas feels good right now. I love your reminders. Thank you so much!!!!! I’d like “How to Create a Microbusiness that Matters”, and today I think I need the permission to let go. I’m nostalgic by nature, and while I generally try my best not to hold on to too many things/feelings that aren’t actually useful/good for me, some days are better than others. This day (and more often than not lately) I’m not doing as well as I’d like, and sometimes it’s nice to be given permission when I’m having trouble giving it to myself. Thanks for this giveaway, and thanks for your perspective & encouragement! I’d love to have the Zero to 100 course about blogging. I’m in the process of starting to blog again, and I’d love some help and inspiration. Congratulations on five years! You’ve influenced a number of people’s lives for the better, mine included. I’m thankful for your efforts. Of the list you provided, presence is the thing I need that gnaws at me the most. I can’t even count the number of times I’m at home with my young children, but I’m not playing with them or enjoying them. Instead I’m thinking about work or something I want/have to do in the future. When I’m at work, I long to be at home with the kiddos. It’s a vicious cycle. I hate it and I’d like to stop. Should I win a micro-course, I’d like to (lovingly) re-gift it to my wife. Whatever she wants. I’ll take the kids out to the park or something. (and if she refuses or if this breaks the rules in the fine print, I’ll take Meaningful Mornings). I enjoyed this post Courtney. I would like the Create a Microbusiness that matters course. I am currently in school to be a holistic nutrition consultant and this course would give me some good ideas as I launch this second career in the fall. I have read your blog for several years. you always give me something to think about as I continue to simplify my life. Courtney – I so enjoy your blog. It is one email I really look forward to reading. I am approaching a crossroad – both emotionally and financially. My daughter (30) is starting to spread her wings again after a 2+ year fight against cancer, and I need to let her fly while trying to maintain a healthy safety net. And my career is about to wind down as I look toward retirement. Hope and patience are big concepts that I am working on. I am ready to move forward with something for just me – and either the microbusiness or blogging courses would be a real boost. Thank you for what you write and share! I’m constantly in need of presence. I struggle very much with being present in the moment; I’m distracted by worries about what is to come (work, finance, relationships, family, etc), regrets, or replaying past events in my mind. This is something I need to work on, especially for my son, a toddler. I want to be a present mommy for him. I think the creating a meaningful morning routine course would be helpful. By taking time to build a routine that sets myself up to be mindful, intentional, and centered for the rest of the day, I think that I can embody presence more fully. I love this post and the gift I gave a few people today was patience:) I would love the zero to 100 course. Thanks for everything you do! I’d love to win your “How to Create a Microbusiness that Matters” course and the gift I need most at this time is health. Thank you for all you do to make our world a better place! oh my, the “patience” note did strike a chord on this new mom. my son can drive me crazy and be so consuming that i feel frustrated for not being able to do the 1000000 things that run through my mind… but you’re right, better go with the flow. Presence is the gift I need the most right now…I get too caught up in regrets of the past and wishing for a different future. I would love the course about “How to create a meaningful morning routine”. Thank you for this opportunity, Courtney. I definitely need the gift of stillness in my life. I haven’t sat still in a long a time and I need that balance and grounding right now. I would love to participate in your Zero to 100 course. Again, thanks for the opportunity and thank you for being an inspiration. Happy 5 years! I am so interested in your info on dressing with less. I would love to win the dress with less and create a wardrobe capsule, thank you for the giveaway and congrats on your anniversary! Hi Courtney! I took your blog course and I would love to take your micro business course! Thank you for this blog, I’ve said it before and I’ll say it again, your words changed not just my life, but my husband’s life and like a domino effect, I hope I am changing lives too. Thanks to your examplem, along with those of some of your peers, my husband and I decided to move out of our 4000 sf house (with 2000 sf of unfinished basement) to a 2-bedroom townhome. This move allows us both to retire this year. We are in our 40s and ready to embrace our new life. I’d live your guidance on a new morning routine. I want to thank you for all the wonderful inspiration I have received from your wonderful blog and Facebook posts. You share so much wisdom and practical advice…..it has changed my life for the better. Congrats on the five years. I hope you continue. This “most meaningful” giveaway is really the best ever. Oh, Courtney. I would love the micro-course for morning routines. I am NOT a morning person, but I live in a morning world as a school teacher. I would love to explore ways to make this easier. Thanks for the chance to win. I am most interested in the How to build a micro business that Matters course and the gift that I’d currently like is Love. Happy Anniversary! I’ve been following your blog for a few years now and am grateful for the things you share. I usually just read the posts via email, so I’m not sure how many comments you normally get. If I am any indication, you will be getting many more comments than usual! I was laid-off 9 months ago, and have been working on my master’s degree in the interim(which I had started before the lay-off). One would think the microbusiness or blogging courses would be the one I would pick, but I could really use an improvement in my morning routine. Since a lot of my work has been academic study over the last few months, I’ve kept a very inconsistent schedule. Work, play, rest, and self-care are usually on a whim, instead of a result of purposeful planning. I am in the middle of a job hunt, and getting back into a routine (and starting a better one) would be quite helpful! I would be very grateful to win the course on morning routines. And I could sure use some clarity. I am interested in the How to Create a Microbusiness that Matters. I have been looking for ways to finally leave my current job and concentrate on the things that matter and that give me happiness. Happy Anniversary! I have been a quiet fan for several years. I would appreciate the “creating a microbusiness that matters” not for me, but to give to my husband as he really wants to create his own business. I already have my own business and love it and I hope he can experience the same thing someday. I just wrote my first “real” blog post! That’s in quotes because I had a blog a few years ago that I only posted my art on and rarely wrote for. That was then, this is now:) I bet you know which course I’d love!!!! What a lovely post today. Thank you. I think Presence is the gift I need most today (after a long, stressful week with a family member in the hospital). Things are improving, though, & I want to remind myself not to worry about the past or future, but to be present in the present moment. I am really interested in the Zero to 100 microcourse (as I ponder things at a crossroads in my life…). Congrats & happy anniversary on your blog! I would love some help simplifying my routines with a capsule wardrobe! Each one of your microcourses are worth their weight in gold! I have so enjoyed reading your posts. I have decided to make a grab bag of gifts, starting with the ones you have listed, and draw one every month for myself or for someone else. Permission to let go is the one that I needed right now. So… thanks! I would be interested in the Zero to 100 mini course. I just recently found your blog and I love reading it! I’m just starting on my journey towards minimalism and your blog has been so motivating! I have yet to read a post that doesn’t totally speak to me. It always seems that your posts are just what I needed to hear that day. Being that I’m just starting, I’d love to get the course on creating a capsule wardrobe. Also, the gift I needed today was Permission to let go. I’m still learning how to let go of not only physical items, but also things I can’t control. Congratulations on 5 years and Happy Anniversary!! 🙂 Thank you for writing this blog; I’m so grateful to have found it! The gift I need the most is Presence, I am always finding myself doing 2 things at once and thinking about 3 others. The course I would like is the morning routine class. Congratulations on your anniversary! I just want you to know that your blog inspires me the most and continues to be my strongest guide in my efforts to simplify and prioritize. Thank you for all that you do! I think we definitely need more love in this world and the Wardrobe Time Capsule is the course I would love and need! Congratulations Courtney!!! And thank you!!! You’re such an inspiration. Having experienced a few challenges in the last couple of years, the gift of gratitude is important for me. Learning to focus on all that is ‘good’, rather than the ‘not so good’. I’m finding that by placing an emphasis on the positive and noting these in a journal, helps put things in perspective. Currently I’m having a website developed titled ‘Celebrating Success’ to enable others to share their stories of overcoming life’s hurdles and how they celebrated their success. As such, I’d be most grateful if I was fortunate enough to win the ‘Zero to 100: A microcourse for beginning bloggers’. Love. Always more love. The best of all possible gifts. So glad you started this five years ago. Long may the love continue. I am delighted to purchase From Zero to 100, and this was just the nudge I needed to do so. Please choose another lucky person if my number is randomly drawn. I am definitely working on “Presence.” Currently listening to Mindfulness for Beginners to help with that. I would LOVE to take any of your courses, but right now I would benefit the most from a meaningful morning routine. I am thankful that you started writing about minimalism, and I’m thankful for you. The gift I’m taking with me is “clarity” as I’m writing my doctoral proposal. Clarity helps with that and so much else to focus on what truly matters! I would love to participate in the Zero to 100 course, if I get selected. Thanks again for all you do to encourage other folks practicing minimalism! The gift of the “permission to let go” and gratitude are things I’m working on. With my husband’s recent cancer diagnosis, I’m learning that I need to let go of my anxiety and fear and be grateful for the time that I and our young children have with him. All the courses sound extremely helpful to me, but the mini course about blogging definitely stands out. The gift I need most is the gift I think most people can use, hope. No matter what life throws at you, if you have hope, you can do what needs to be done to get back to where you want to be. I would like to win the microcourse on “how to create a microbusiness that matters.” I have always felt that I have so much more to offer then I expend in my desk job but I don’t know where to start. I have hope that there is something else out there but I need some help getting there. Happy Anniversary! Thanks for reminding us of all the gifts in our life. The gift I need the most is “patience.” If I were to win your generous giveaway, I would especially like the capsule wardrobe. Thanks for the opportunity. I would choose dress with less… I seem to be struggling with pulling together a capsule wardrobe. Last year I purchased your “Create a Meaningful Morning Routine” microcourse and it has completely changed how I start my day. I used to get up and check email and before I knew it, an hour had passed and I had to scramble to get ready for work. With your help, I started my morning routine and gradually expanded it to a full hour every morning. I get up at 5:00 a.m. and start by reading for 15 minutes, then switch to writing and I now write for 45 minutes. Afterward, I still have plenty of time to have breakfast and get ready for work, and some mornings I don’t check email at all. I would love to work through your microcourses on being a beginner blogger or creating a microbusiness. And I can definitely say that whoever wins the five prizes is in for a life-changing experience. Thank you, Courtney! Love your content. It always makes me stop and take time to consider how it applies to my life. I would love to take your microbusiness course. I’m currently on the path to starting a part-time business in something that I’m passionate about. At the moment I am experiencing job insecurity and the gift I need most is gratitude for what I have and to be patient until things calm down at work. the course I would most benefit from is How to Create a Microbusiness. that will help me have potentially another source of income and would be a happy distraction from my daily worries. I would love to do the course on morning routines! Right now I could definitely use more self-compassion. Thanks for creating such a wonderful site. Whenever I read your post I feel that I have learned something new and the sense of peace takeover me. I would like to take Zero to 100: A microcourse for beginning bloggers. I have my own blog named as selfawake.com and I want to take it to the next level and I am sure your course will help me on the same. The gift I want is Gratitude. Recently I have started practicing it but I want to feel it from the bottom of my heart and does not want it just as a daily process. I’m really interested in you “creating a microbusiness that matters” course. I try to tell myself “you are enough” but I often forget. It comes easy to say to my friends, but I’m much more demanding when it comes to myself so thank you for the reminder. Hi Courtney, I love your posts, always inspiring. I wish for clarity, my mind gets clouded with other stuff; and presence. I would love to do the zero to 100 course. Thank you so much for your encouraging posts. I’ve been struggling for years to return to the more simple life I had 30 years ago, when we didn’t have lots of money or possessions but had time. Somewhere along the way, we too bought the advertisers’ lies that more possessions make more happiness, more time, a better quality of life. But bloggers like you helped us to realise that was wrong, and our attitudes of 30 years ago were correct all along. Stuff and money do not make happiness. And knowing others feel the same is all the encouragement we need to slowly work back to where we once were. So thank you! Should I win, I’d love the micro-business course. We are actively reducing our stuff to “just enough”, and the next stage will be to actively reduce our working hours to “just enough” too. Hi Courtney. I wanted you to know I’m a daily visitor here and your words are very inspiring to me as I work on minimizing my life. I’ve been working on gratitude this year but I struggle with presence. I would love the course on morning routines or capsule wardrobes. Congrats on five years and thank you for all you do on a continual basis. Happy 5th anniversary, Courtney! I love the photos and words of wisdom that you put at the top of your posts – they’re like a breath of fresh air in my RSS feeds. I’ve just moved to a new country and will soon be facing the daunting task of finding a new job, so Presence is what I really need now to enjoy the time off while I can! 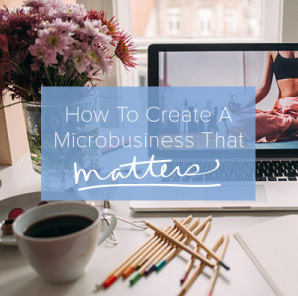 I’d love to spend some of that time doing the “How to Create a Microbusiness that Matters” microcourse. Thank you and best wishes for another five wonderful years. I think the gift I’m most in need of at the moment is “Clarity” (with a large dose of “Presence” on the side!) I recently quit my job of 10 years because it wasn’t doing me any favours, but now I’m in limbo, not exactly idle but not achieving much either. The course I would be most interested in is Zero to 100. I’ve had a blog for years, but haven’t been consistent or regular with it, and have never given it a real purpose. Courtney, you have really been delivering what I need this year and I have been following through with suggestions. I have really benefitted from your post, “The Life Altering Practice of Making Cuts.” This post is also helping me through some difficult baggage. I would enjoy learning about blogging from the “Zero to 100” microcourse. Here’s to another 5 years of Be More With Less! Happy Anniversary and thank you for sharing your word of wisdom! I’ve been a wife, mother, business partner, caretaker and community volunteer for most of my life. Like most women I have always focused on taking care of others and put myself second. Now my children are grown and I am semi-retired and it is time for me. Clarity is the gift I need. What do I need to be happy and healthy and how do I get it? Your course, How to Create a Meaningful Morning Routine, would help me start my day with focus and I believe that would help bring some clarity into my world. Congratulations on your 5th anniversary. I found your blog after subscribing to 31 GiftsYou So Deserve. I loved receiving the daily messages, it helped me to slow down at the busiest time of year and appreciate the little things like Toast. The gift that I need right now is hope. My family has been through a lot recently and hope is what helps us through it. I would like help downsizing my closet so the capsule wardrobe course would be very helpful. Thanks so much for this blog and here’s to many more anniversaries ahead “Toast”! I need patience and health. Your line about being frustrated with things not happening fast enough, but in reality they are happening at a rate we can handle really spoke to me. I’ve been feeling very impatient with my business lately. As for which course I’d like to win…I’d like to win the Zero to 100 Microcourse for new bloggers to give to my sister who is just starting her blogging journey. I’d love to take the dress with less course. The gift I want more if in my life is hope! Thanks for all your encouraging words over the years. Congratulations on five years!! I’ve been reading your blog for a couple of those years and it’s really help me a lot and I think the course it would help me the most is getting a meaningful morning routine !thanks so much! Courtney, these giveaway gifts were so appreciated. Happy five year anniversary! Your work has brought a lot of self-reflection into my own life, and I am really grateful for the guidance. As a result, I’ve completely resized and revamped my wardrobe (something I’d never even considered before! ), and have found such a shift in my confidence and calmness now that I have clarity on what outfits work for me and bring me joy. It sounds minor, but that stress used to take up a portion of every day! I’ve also used your coaching guide, “Zero to 100”, and recently launched my own blog – something I’d been hoping to do for years, but was scared that I would have to rely on pushy marketing techniques. Again, you helped to bring clarity and simplicity! Today, the gift I’ve needed the most is patience. Lately I’ve been wanting to change so many aspects of my life, and want them to be changed immediately. I know this stems from my desire for the comfort of control, and the reminder to step back into an accepting and patient stance is helpful. The micro course I would most appreciate right now is the course on building a meaningful microbusiness. Thanks for all that you do! The gift I could use is Stillness. I go through periods where I am disciplined to be still in meditation. But then life happens and I don’t make the time to do it. It makes such a huge difference when I do take the time though. I would love the Capsule Wardrobe course. I have been working on reducing my wardrobe, but am terrible at determining what to keep so that I have coordinating outfits to wear. Would really benefit from the morning routine course. I work shifts & I’m struggling with a morning routine, even if the “morning” happens in the afternoon! Morning routine would really help my lazy bones get out of bed in the morning! Just want to greet you a happy 5th Anniversay, and send good wishes for many more blogging years. Your blog is like a breath of fresh air. Happy Anniversary Courtney!! I have been following you for several years now and you are such an inspiration. My husband and I are downsizing dramatically and looking to retire on a sailboat. The gift that I need the most is permission to let go. When you start downsizing it is so hard to “let things go”!!! The micro course I would appreciate the most right now is your course on building a meaningful microbusiness. Thank you for all that you do! Permission to let go is the gift I really need. Working on that everyday. I’m interested in the course about creating a micro business that matters. I’ve been toying with the idea of starting my own business, but haven’t got the gumption to go for it yet. Happy Anniversary Courtney! Thank you for sharing your wisdom and the journey of less. I’m a 26 year old, newly wed and often feel it’s glamorous to have more, however I find that philosophy to be draining and visit your site often to recharge. Presence is a gift I’ve been needing along with the desire to give it away in abundance. “The remedy for the angst or fear that may cause is the present”. The micro-course that I would be so grateful to receive would be Zero to 100: A micro course for beginner bloggers. I recently purchased a domain for Something Borrowed, Blue & True. It’s my goal to create a blog that is a resource to newly engaged and married couples that highlights the beauty of marriage while planning a celebration. Thank you for everything you do. Between your blog and Becoming Minimalist, I have been inspired to simplify my life as well. I’ve come a long way already, and your blog helps me stay on track. Your blog is great and I look forward to reading it each day! Congratulations and gratitude for shining your light so brightly. Today I resonated with the gift of a permission slip to let go. A divine reminder. How to Create a Microbusiness that Matters feels right for me now. Thank you for the reminder of the existence of all of these gifts. Right now I think I could use clarity and being present in the moment. I am moving into a duplex unit with my two daughters next month. We have greatly downsized our possessions over the last year. We have been becoming more intentional with our lives. I desire to streamline my life and my daughters’ lives. I intend to weave my girls’ learning, our income stream and way of living into a simple, intentional tapestry that we can enjoy and thrive on for years to come. I find myself anxious and afraid at times when I consider all of the unknowns that come along with all of this. The process of being intentional with the items that share my space and how I spend my time, has provided me with a lot of opportunities to flex my decision making muscles. This has provided a foundation for me to make the aforementioned moves with more confidence and ease than I could have in the past -even a few months ago,- but at the same time I still must focus on being present in the moment and taking one step at a time to not being overwhelmed and discouraged. Thank you for the guidance and inspiration you provide witht the work you do. It shows me that the kind of difference I would like to make in the world if possible. I have purchased you Zero to 100 already. I would appreciate the Microbusiness that Matters. This is what I am striving to create. A business that makes a difference in others lives -and my own- and at the same time does not take over my life and become overpowering, taking my time away from the ultimate priority in my life right now which is time for myself and my girls as they are growing up. I want to model for them self care and love. I also want to show them that dreams lead to reality. That what we put our attention on grows and it does not have to exist now to be possible in the future. I very much appreciate the emails I’ve been getting. They are helping me keep focused on my goal of being more with less. It is a constant struggle. After believing I had greatly reduced my possessions, I moved. I realized I had only touched the tip of the iceberg. So the emails help. I need Compassion for myself. I have it for others but not usually so much for myself. I would be interested in the morning routine course. Congratulations on your five year anniversary! I would say the How to Create a Microbusiness that Matters would be very beneficial. Many thanks to you for sharing! I’d love to take the How to Create a Microbusiness that Matters course. Sounds so interesting. Thanks, Courtney!! Our family just sold our house and are preparing for our move June 1! I can hardly wait to reap the benefits of downsizing! The – How to Create a Microbusiness that Matters – course is very intriguing to me, especially with all the extra time I will have on my hands! Congratulations on five years! Thank you for the work you do. It helps me feel validated in my “less is more” choices when the world around me so often tells me otherwise. The gift I could most use right now is hope. The future seems kind of scary to me at the moment. Since losing one of my part-time jobs in January, I feel myself getting farther away from my long-term goals of being debt-free and seeing more of the world. I would love to take the Microbusiness course so I could develop a new income stream that could help me achieve my goals and make the world a better place at the same time. The gift I need right now is Presence. My daughter is 10 months old and I feel like time is being stolen from me lately. I just want to be able to live in the moment and appreciate the present as much as possible. I would love to win the “How to Create a Microbusiness that Matters” course. I need the extra encouragement in this area and feel that I could benefit greatly from the advice and wisdom you have to offer. Congratulations Courtney! You have inspired and helped so many people. I am interested in the microbusiness or dressing with less course. I quit my full time job and simplified my life to be present with my two young children, but struggle to make ends meet with part-time work and paying for childcare. I’ve read project 333 and have pared down and simplified a lot, but could use a boost. And the gift that I most need today is hope. I could use a little clarity right now. And maybe a little more stillness to open up to that clarity! I am currently restarting/making some changes to my morning routine, so I’d love to try that course. I went ahead and purchased the Create a Meaningful Morning Routine for myself. I thought it would be a great Mother’s Day Present. So if you were to choose me, I guess any of the others would be great with me. I love all of your postings. Thank you! Thank you Courtney. The gift I need most today is patience. I’d love to take the capsule wardrobe course. Happy 5th, Courtney! I would love the Create a Microbusiness That Matters Course. I have so many interests – I would truly appreciate help in narrowing my options to the one that can contribute most to others. I would love to participate in the capsule wardrobe, dress with less course. I seek stillness and probably clarity also. After 9 years of focusing mostly on children and work I find myself with a very different body and would love to find dressing myself a much simpler task than it is. Being a plus size adds to the challenge also. Thankyou for you Blog! I love seeing your posts pop up! I’m looking to make writing a major focus moving forward, so I’d love to try out Zero to 100! Hi Courtney! I have been reading your blog for 5 years, since I was recovering from donating part of my liver to my then 16 year old stepson. (Who by the way is doing well 5 years post-transplant.) It was a point in time when I had lots of time for thinking anout my life and how crazy things had gotten. Between reading your and other blogs I experimented with Project 333, simplified my life, got our finances under control and eventually we went on to sell our house and move overseas to teach and travel. Although I love teaching, I still find myself incredibly busy and over committed to my career. I have a hard time allowing myself time for me. The gift I would like for myself is presence. Actually I would really like to retire and travel more, being present and enjoying all that is in our world. With that, your course on starting a blog (I started a blog at one time to share our transplant journey with close friends and family) would be a wonderful way for me to share my perspective and travels with others. Courtney, thank you for sharing your inspiration and simplicity with the world for the past 5 years. Your messages have made a huge and lasting impact on my life. The gift I need most is compassion, for myself and others. the course I’d like is How to Create a Meaningful Morning Routine. Congrats on 5 years. You bless us with your insights. I’m interested in either 0-100 or microbusiness. Keep up the good, effective work. Hi Courtney – Great post! I would love the course on creating a meaningful morning routine. Patience for me, especially at work! And I’d like to take the How to create meaningful Morning Routine course. I love how the idea simplicity is even reflected in your writing. Simple ideas, yet deep and sometimes difficult to carry out. Good reminders. I’m most interested in 0 to 100: a micro course for bloggers. I would love to take the Start a Microbusiness That Matters course. I’d like to be more available to our 12 YO daughter by working my own business, and not leaving the house every day to go to an office (where, if truth be known, I can get everything done in 1/2 day). So Patience is the gift I need most right now, because I’ve been hoping and praying for being a SAHM for a long time now. Thank you! 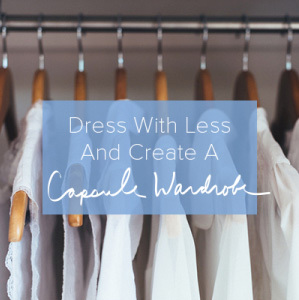 Dress with less… Capsule wardrobe. Clarity…. What a great gift! Thanks for the great articles, too! first I would like to thank you for the inspiration and hope you have given me, when I felt like drowning in clutter. Your blog is appreciated here. I would be very interested in the microcoure for a capsule wardrobe – I have reduced my stuff a lot during the last year (2 bulging wardrobes to 1 1/2) – but I am certain, I could still do a lot better with even less. First of all, congratulations, Courtney! This article is really inspiring I must admit this is the first one I’ve ever read on your blog, and I’m a bit lucky, I guess? And since you’re giving stuff away… “How to Create a Microbusiness that Matters”, and the gift I’d need most, which I think a lot of people would need too 🙂 –is Hope. Thanks for this post, Courtney. I think there are only a few who can “hit the mark” just like you did with this article. It does speak to the soul. I would love the mini course on creating a meaningful morning routine. I’ve been reading you for over a year but have read through the archives as well. I love the ‘voice’ of your writing and your message. I’d like the course on starting a microbusiness to help me build and launch a business for my photography. In today’s post the word ‘answer’ in how to live in the present really struck me. Others have used the ‘live in the present not the past or the future’ refrain. But I was looking for a solution to the worry that comes from the past/future issue. Seeing the present as an ‘answer’, as a specific action I could take when I wander off, was so useful. Thanks. Thank you for this opportunity, I think the gift I need most now is Patience, it’s never been a strong point with me! I would appreciate to be picked Courtney! 0-100 or microbusiness would make me happy. I think the gift I need most is Patience. I am a recovering shopaholic and have been taking steps over the past few years to curb my spending, reduce my wardrobe, and live with less. However, I often become impatient with my slow progress as I find myself still being tempted my credit card offers and battling the desire to go on shopping sprees. Patience with myself is a gift. I am moving slowly, but I am still moving in the right direction! That being said, I believe the “Dress with Less” course would help continue my journey of overcoming consumerism and practicing simplicity in my daily life. Thank you for your encouraging posts! Keep up the good work! And I most certainly need health. I’m dealing with a Crohn’s flare and it’s rough. I eat really well, but stress control is HARD. Thanks for these great Anniversary gifts, Courtney! Happy anniversary, Courtney! I will carry the gift of Hope with me this week and see how that goes. I might even stick a little bit of Clarity in my pocket to go with it. Thank you. As for the giveaway, I’d be thrilled to explore Zero to 100. Huzzah! Happy Mother’s Day Courtney. I would love to create a capsule wardrobe and dress with less. Thank you for all that you do, you are a true inspiration. I have followed you for a short while, and you have touched my life in ways unimagined. I have been a single father for many years after wifey succumbed to cancer,and I found myself alone raising 2 toddlers (mid-teens now). I ask for H O P E with a healthy dose of clarity… please. I would be honored to win the zero to one-hundred course, and place knowledge into action. Thank you for being a part of my spiritual forte,and for going the distance… salute! choosing joy for myself as well. Hi Courtney, Happy Mother’s Day! I would love to win Zero to 100. I think I need permission to let go of fear and worry. I let it control to much of my life. Congratulations on five years. Every time I visit your site, I am encouraged. The gift of presence resonated with me today. I have a hard time being still and fully inthe moment without thinking ahead regarding what else should be done later. The course I am most interested in is the microbusiness course. Thanks for listening. I am interested in your course on creating a meaningful morning routine or the microbusiness course – you have a beautiful website, and enjoy keeping up with your blog. Thank you so much for your posts, they are timely and always on target! I am most interested in the Capsule Wardrobe course. I need permission to let go – of so many, many things/issues. Hey, Courtney! I’m here… Brazilian blogger! I love your idea ! Well, I think that I need clarity to go ahead with my new blog, help people and change it in my work. Then, I’d like to win Zero to 100 or How to Create a Microbusiness that Matters. I so enjoy your blog. I retired a year ago and so I have found many of the gifts in today’s blog over this past year, but my health is the gift I need to work on the most. I have the time now and I need to make it a priority. I do blog, so I feel I would benefit from the Zero to 100 course the most. Just love your website… really helping me be mindful of what I am buying. Hope I’m still in time for the giveaway! Thank you for your encouragement and for being an inspiration to me! Reading your post today was very uplifting to me, as I have many regrets about my past! However, by the grace and forgiveness of God, I am moving forward and it is so true that letting go is very healing. I am pledging to be FULLY PRESENT (put away my smart phone), and LISTEN better to my husband. I am very interested in the capsule wardrobe course, as it is quite scary to me to even think about having less articles of clothing! I have been wanting to do this, but it seems overwhelming to me right now. Maybe a little “nudge” would help me go forward with this! Blessings to you and the way you touch so many people’s lives! This is a great post. I love the thoughts and I’m going to bookmark it and send it to my friends! I’m slowing regaining my health and I’m looking forward to hopefully feeling 100% later this year. If I should win your contest, I’d love to learn about the capsule wardrobe. I love the idea of doing more with less. Patience! The dress with less class. Congrats on 5 years! I would love to learn about creating a morning routine! Happy anniversary! If it’s not too late I would love to be entered. I’m interested in the course on how to create a meaningful micro business. I am interested in the Capsule Wardrobe and patience! Thank you! Hi here, I’d like to win the Morning Routine one, starting my day as I intend to go on…..
Today (and everyday) I give myself permission to Let Go. It’s not easy till it is. And it’s been getting easier since your post “If you want to be lighter you have to let go”. It has stuck. And it is working. Small progress is still progress. And finally, after years and years of clutter and thinking this was me, I now have hope. A ray of light, a glimmer at the end of the tunnel. It is happening. Bit by bit, piece by piece. And the gratitude that flows through me every time I take a bag of ‘stuff’ to the charity shop is nurturing me, feeding my soul. I want to learn how to improve my blog so that I have more than just family and Facebook friends reading it. 🙂 I’d be interested in Zero to 100. Thanks! I think the gift I need (because I see a lack in myself) is patience. I’m good with stillness and curiosity, gratitude, health, love… But patience… my bad! I thought you came up with a good list of gifts, so not sure I can add anything to it… maybe the ability and willingness to say “no”? or a desire to be flexible (“go with the flow”) when that is the best option? Health is the gift I need the most, but I’m also thankful for my chronic illness in a weird way, because it’s given me a totally different understanding of compassion–that the person who most needs our compassion is the one who’s hardest to give it to, namely ourselves. I’d like to win the microbusiness course–I’m working on building non traditional employment for myself, so I can better accommodate the health issues I live with, and this sounds like a great step. Happy anniversary! I would love to check out your course on micro businesses. Thanks for offering this opportunity! Every post of yours is a gift… Every time I am looking for inspiration, I turn to you. Today, I really need gratitude and patience.